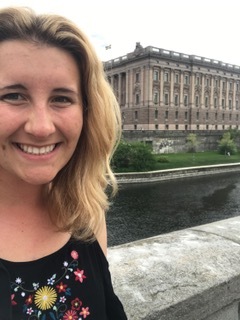 This is the third in a series of blog posts from Whitties studying on Whitman’s Crossroads: Pollination Biology in Sweden program this summer with Professor Heidi Dobson. Gareth Jones ’19 is a biology-environmental studies major. For my blog post, I thought it would be great to provide some insight into one of the major projects assigned over the course of this Pollination Biology class. These work-intensive projects give us (the students) an opportunity to apply what we’re learning in the classroom to a “real” situation in the field and, simultaneously, allow us to practice professional methods of data collection and presentation. In many ways, these reports are an embodiment of what this course is about. 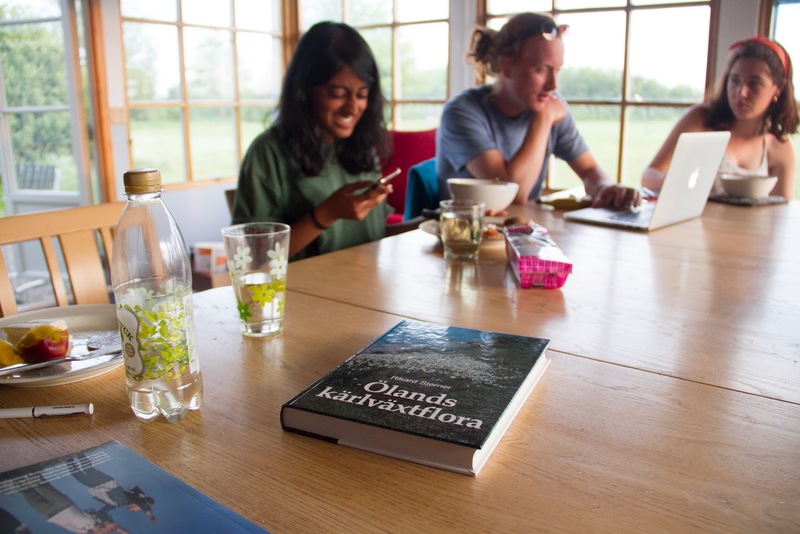 During our five weeks on Öland, we will do three partner projects and one independent final project. 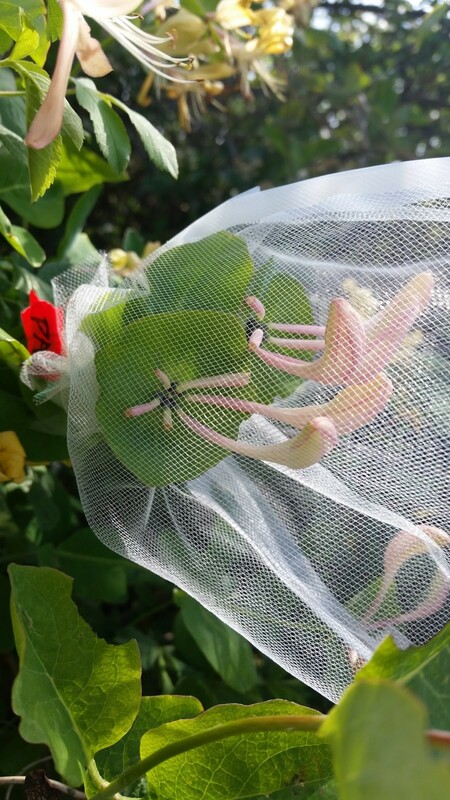 In general, we are responsible for the following steps for each project: selecting an appropriate plant species within biking or walking distance, researching the chosen plant, conducting different experiments in the field and observing/recording results over a period of several days. After data collection is complete, we deliver a brief presentation to the class explaining what we discovered in researching our plant and the results of our study. Finally, all of the information listed above is put into a well-manicured report. In general, the flowers of L. caprifolium begin to enter anthesis during the early afternoon and late evening. As shown in Table 1, the calculated average time of anthesis occurs around 18:16 — however the observed times ranged from 17:00 to 19:00. At the research site in Öland, Sweden, sunset during the month of June typically isn’t until 21:30. Therefore, anthesis routinely occurred well before nightfall. A large amount of daytime pollinators (i.e. Apidae bumblebees) were observed buzzing between flowers near the time of anthesis. 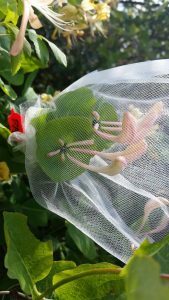 Example of bagged inflorescence of Lonicera caprifolium. Hopefully, this gives you a sense of the kind of work that goes into the projects of this course! I have found these reports to be incredibly interesting and formative experiences. 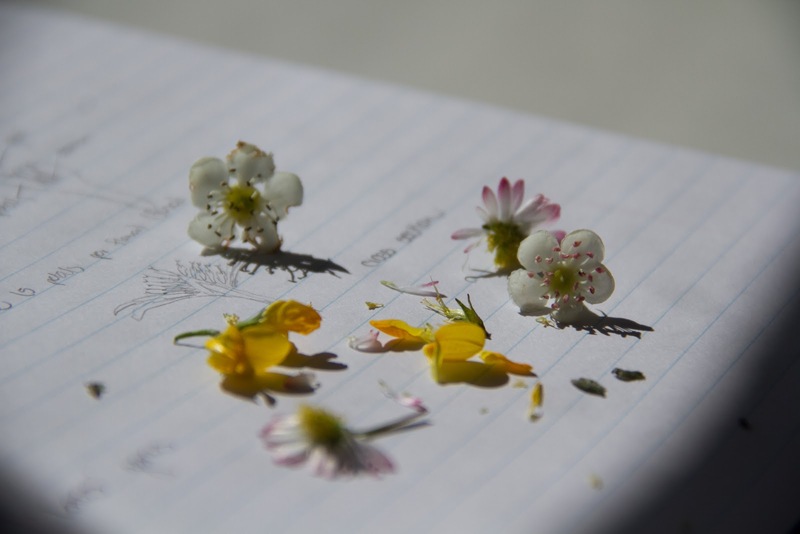 This kind of work is why the idea of a Pollination Biology course was so attractive to me – not to mention the beautiful scenery and amazing cultural excursions that I’m sure my fellow students will write about in their blogs! This entry was posted in Uncategorized on June 14, 2017 by hoffmabb. 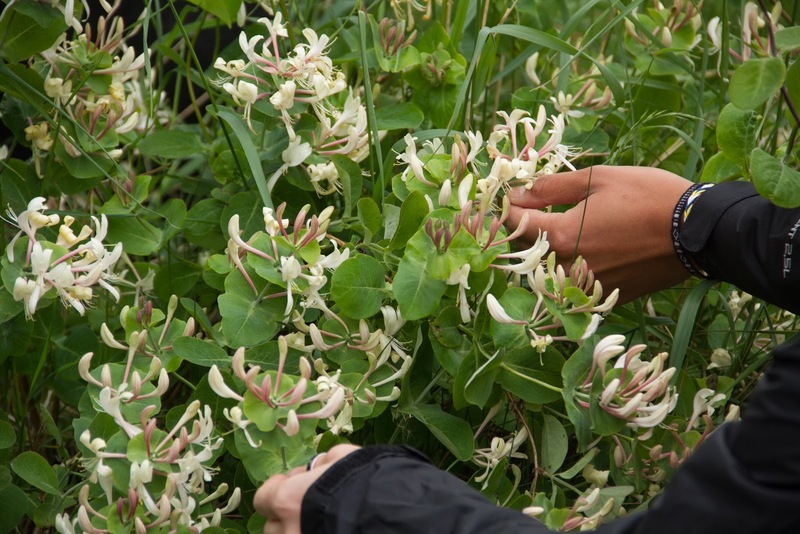 This is the second in a series of blog posts from Whitties studying on Whitman’s Crossroads: Pollination Biology in Sweden program this summer with Professor Heidi Dobson. Natalie Mutter ’20 plans to major in biology. Greetings from Station Linné. We’ve just finished our third day of classes on Ӧland, and the time has flown by. Hearing of the groundbreaking and influential research that has been conducted here in the past, as well as projects that are underway presently, I feel incredibly grateful for the opportunity to study pollination biology here with great friends, scientists, and mentors. 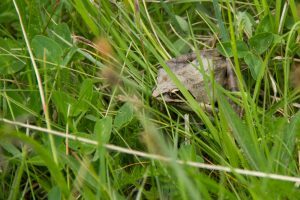 From beginning our first project on plant breeding systems to pinning our first insects, we have leapt into the biological wonderment of Ӧland. Although these projects are the center of the experience here at the station, we have also found that living in a new place provides all kinds of learning opportunities. Our time at the station is spent mostly in the lecture space, the field, or the lab, and we share meals and conversation in good company in the dining room. Wide, tall windows line three walls, welcoming in an extraordinary amount of light. The sunsets have encouraged me to go running later in the evening, as the sun sets around 21:30. 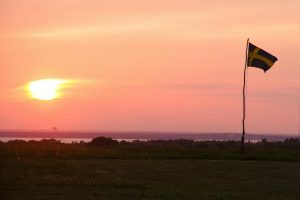 This image shows the setting sun on the day of our arrival to Ӧland, with one of the three Swedish flags that stand at the front of the station blowing in the wind. The roads surrounding the station wind through strawberry and lucerne fields, with houses dotting the land with red and white. Cows and sheep graze in pastures edged by rock walls, and the nightingales sing incessantly. In the field, we have been learning to identify members of several plant families we have studied in lab. Students observe and identify the various parts of the flowers on a honeysuckle in the image above. 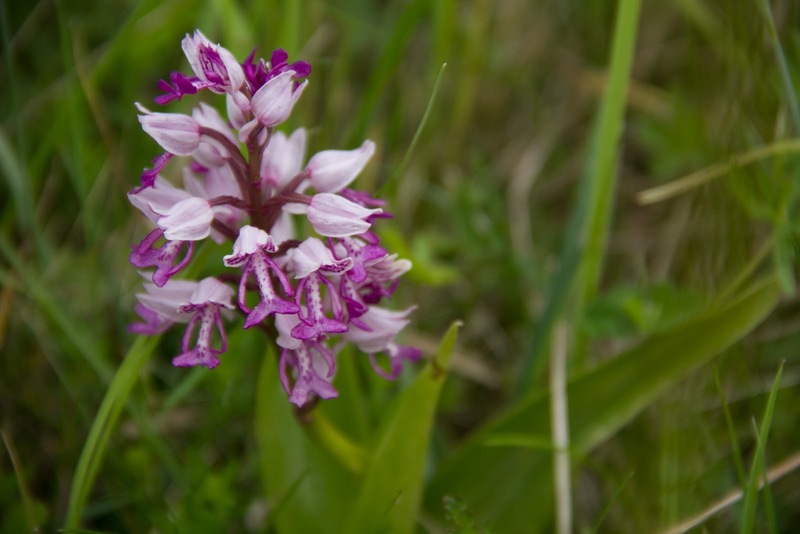 We are immensely lucky to be present on Ӧland when the orchids in bloom. In the field next to the station, several species of orchids are blooming in columns like these. 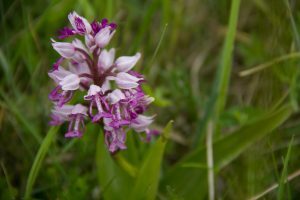 The orchid family (Orchidaceae) is one of the first families with which we became acquainted during our first lab here at the station. 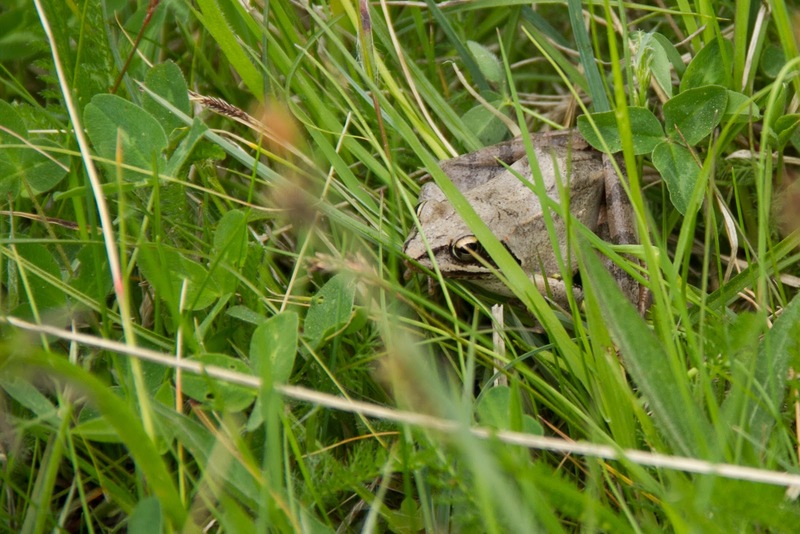 Frogs and caterpillars lurk in the grasses. As Professor Dobson said in the field yesterday, “if you sit and wait, you can see life unfolding around you”. I must tread carefully as I walk – buttercups and daisies bloom everywhere. In the above image Professor Heidi Dobson and student Ian Gingerich (‘19) identified members of plant families in the field just outside of the station. We collected flowers from different families to see the variation in the arrangement and design of their sepals, petals, stamens, and pistils. Back in the lab, we examined the specimens closely under dissecting microscopes, drawing cross-sections and writing detailed notes in our field notebooks for reference to the families we had just learned. Although we have only been on Ӧland for four days, we have packed an impressive amount of learning and adventure into our time here. I look forward to continuing work on our research projects and learning more about the complex mechanisms that create and sustain so many forms of life in our world. This entry was posted in Uncategorized on June 6, 2017 by hoffmabb. 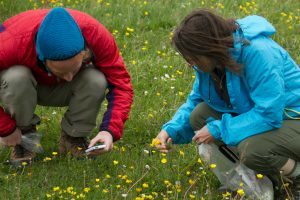 This is the first in a series of blog posts from Whitties studying on Whitman’s Crossroads: Pollination Biology in Sweden program this summer with Professor Heidi Dobson. Melia Matthews ’20 plans to major in biology. Whew! What a s tart to our trip! The first few days in a new country are always a unique and eye-opening experience, and our few days in Stockholm were no exception. 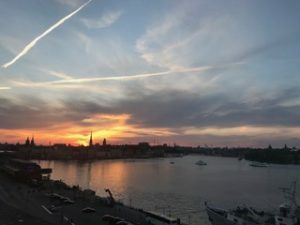 I came to Sweden 24 hours ahead of the group and I set out to explore the city of Stockholm for a few hours before my jet-lag set in. For me at least, you don’t notice too much out of the ordinary if you aren’t paying close attention…There are cars and streets and buses and people and coffee shops…even if you can’t read the signs very well, it still seems like a normal city that isn’t too strange. So I decided to look a little harder to see what differences I noticed first. Surprisingly, the first big difference I noticed between Sweden and the US were the stoplights! Instead of hanging from wires across the street, they were on poles rising from the ground on the street corners; also the street signs were in white on the sides of buildings instead of green on a pole…so it took a bit of effort to find my way around at first! But anyways, on to more big picture matters…While my overall impression of Stockholm was maybe a bit greener and cleaner that many large US cities, It really wasn’t all that different. There were neighborhoods, tourists, churches and apartment buildings. It was really cool for me to see how different countries can be so different and yet so similar…It was a pretty comforting realization for my first day. Then the group arrived the next day. We checked into our hostel and spent the next two days tourin g as much of Stockholm as possible in 48 hours! We rode about every variation of public transportation as possible, buses, subway, ferry, you name it! We saw the sights but also enjoyed the less touristy areas around our hostel which included a huge park with an outdoor gym and lots of awesome trails. We walked an average of 10 miles each day and started getting used to the Swedish food. 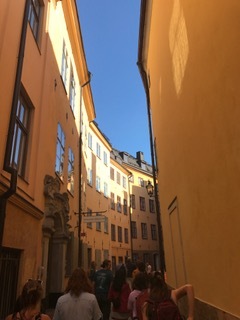 Most of us were also dealing with jet-lag and some sleepless nights, but starting our 5 week visit to Sweden with a few days in the capital was a great experience and was a fantastic way to understand more of the history and city-culture of Sweden, but I also am looking forward to immersing a bit more directly with the land and the people during our time on Öland at the research station! Allie Seracuse: Hej from Sweden again! !